Can you believe it? The first quarter of 2014 is already drawing itself closed. 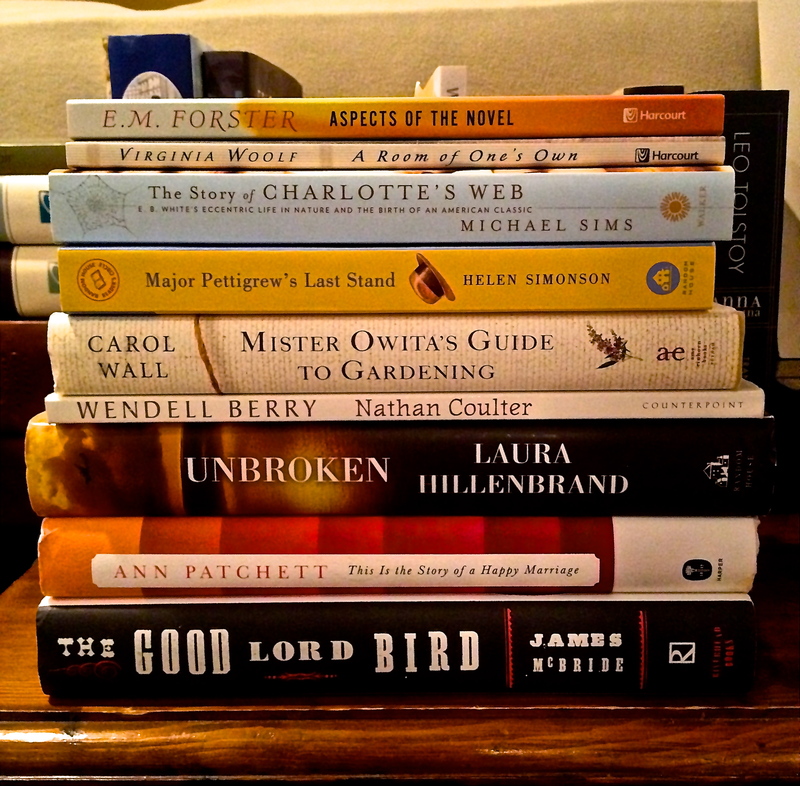 Since I’ve already proven haphazard with my book reviews (one official—title and all—in January and a myriad of personal reflections over one early in March), and since I’ve been agonizing (seriously) over how to share the hours I spend inside the books I read, I thought maybe just a general wrap-up of reading so far would do. Because, while I’m feeling all self-conscious about describing well the books I’ve been reading, I’m even more curious to know what you’ve been reading, too. 1) The Brothers Karamazov, by Fyodor Dostoevsky: Here is the primary reason I drug my feet on doing book reviews in the first place. Sometimes a book becomes too personal. Too deep. Beyond review. I find myself wholly incapable of offering anything of value beyond a sincere encouragement for you to keep the story alive by reading it yourself. This is the second Dostoevsky novel I’ve read (Crime and Punishment being the other). In both stories, Dostoevsky uses his characters and their perils to try and unravel for himself the profundity of forgiveness, redemption, and God’s saving grace poured out to mankind. In the introduction, translator Richard Pevear (Larissa Volokhonsky is the other translator) writes in his first sentence, “The Brothers Karamazov is a joyful book.” This is both an entirely loaded and truth-filled statement. The Brothers Karamozov is the story of a broken family, marginal father, estranged brothers, a dying priest, murder, mystery, guilt, the Grand Inquisitor, and Satan visiting an atheistic brother in his dreams…hardly the stuff of joy. But, it is joyful. It is joyful precisely because Dostoevsky is working out God’s final say. And God’s final say is always one of joy, hope, forgiveness—possibility through impossible circumstances. It is in Aloysha’s innocence, Father Zosima’s wisdom, Demitri’s passion, Katya’s remorse, even Ivan’s troubled atheism. But where I found myself most affected was in the unbridled faith of some rag-tag boys who seem to be no more than a side-story—until, in the end, they epitomize the joy so desperately needed by everyone else in the story. I have read before that besides the Bible, every Christian should read Pilgrim’s Progress and maybe Screwtape Letters or Mere Christianity. 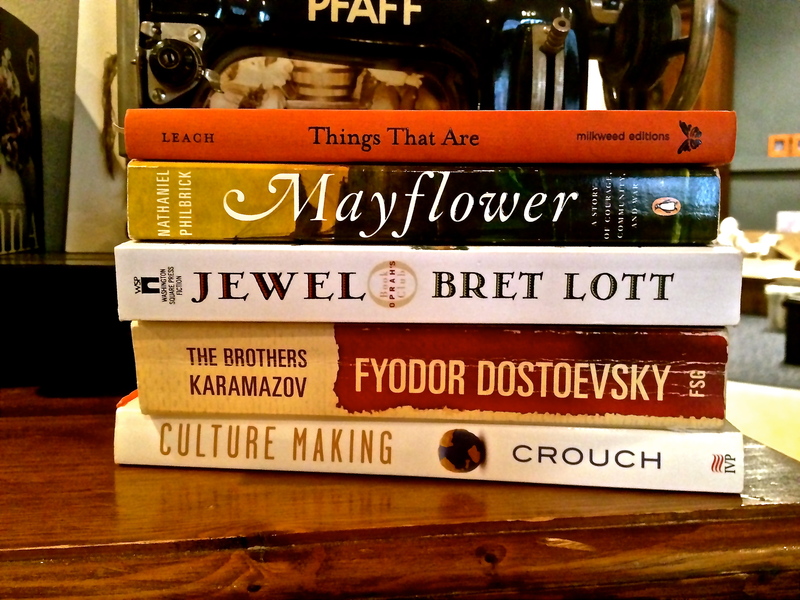 If I were allowed to add my pen strokes to this short list I would add The Brothers Karamazov. 2) Culture Making by Andy Crouch: The word “culture” flows free in conversation and media like water over falls. But what does it really mean? How is culture created? Who drives culture? And what does all this mean for Christians? These are questions Crouch answers in this venerable 21st Century book. Culture Making may not read like a “spiritual formation” book in the way that Willard’s, or Foster’s, or Manning’s books read. But I found it entirely about spiritual formation—our formation into Christlikeness as we cultivate and create culture for Christ. Culture Making has profoundly shaped my understanding of what it means to be created in the image of God, and my potential and responsibility to be both a “gardener and artist” in the cultural spheres where He has placed me. 3) Mayflower: A Story of Courage, Community, and War by Nathanial Philbrick: Now I take a 180-degree turn (literally, if I were in my local B&N) into U.S. History. I bought Mayflower a couple years ago while browsing a local bookstore in Southern Pines. The kids and I were studying colonial America at the time and I thought it would be fun to do some non-elementary school reading on my own. Philbrick is a great story teller, an essential element for me when attempting to read and retain any historical non-fiction. Mayflower tells of the years from the pilgrim’s landing at Plymouth through King Philip’s War. It does not seek to romanticize our country’s beginnings, nor does it demonize the greedy white man. It read a little sluggish in the middle, but the beginning chapters of survival, and ending chapters of a war barely (if ever) mentioned in schools today, were full and riveting. Reading Mayflower forced me to consider the level of desperation necessary for me to risk my family’s life for the vision of a better way. And then I prayed to God I would never have to face it. 4) Things That Are by Amy Leach: This is a book you won’t find at Barnes & Noble or probably even your local independently-owned bookstore. It is a series of short nature essays written with great whimsy and intelligence. Leach writes in the same spirit of Annie Dillard; when I’m reading her essays my mind often drifts back to Dillard’s Pilgrim on Tinker Creek. Leach’s writing is a Candyland for the artist and nature lover alike. I’m only half way through this book. I read it in my moments, one essay at a time, slowly walking through its beauty, memorizing the imagery and color of creation Leach paints with her words. 5) Jewel by Bret Lott: I picked up this book because Mr. Lott is one of the speakers at the upcoming Calvin Festival of Faith and Writing I’m attending in two weeks (!). Jewel both enthralled and disturbed me. It was one of those books I had a hard time putting down, but at the same time, needed to take breaks for the intensity of its story. I’ve always measured the worth of a book by its force upon my sensibilities. Jewel landed square in that center of all my sensibleness and I’m still considering how I would have walked—differently or the same—in Jewel’s shoes. …at least so far. I reserve the right to add, take away, or swap out as I see fit. But here’s what I really want to know…What have you reading lately? Is there something in my new pile that piques your interest? Maybe we could read it together! Thanks for this list. Jewel is one of my all time favorite books!